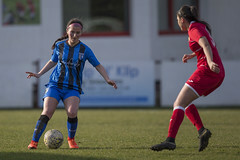 A sunny day without a cloud in the sky saw Gillingham Ladies play against Kent Football United Ladies in the Kent FA Women’s Cup second round.The game begins with Gillingham having kick-off. 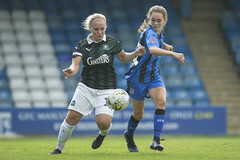 Two minutes into the game and Gillingham have a chance through Alice BUSSEY who played Kylie MANKTELOW but the resulting shot goes just over the crossbar. Eight minutes later and Gillingham have a chance to draw level from a free kick, which is taken short. The shot by Daisy MONAGHAN goes just past the post. A minute later and Kent Football United take a corner which is saved well by Courtney SHANLY in goal who parries, it falls to the opposition who shoot again. This time the ball is cleared off the line by Sharna GIORDANI and goes out for another corner. This ends up with another save from Courtney SHANLY followed by another goal line clearance by Sharna GIORDANI. Twenty minutes into the game and Kent Football United have a chance to go to 2-0 as Rachel STEVENS goes one on one with Courtney SHANLY, SHANLY makes a good save and the ball is cleared away by Vanisha PATEL. 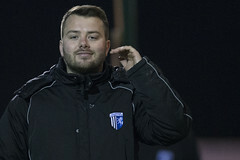 Seven minutes after scoring and Sammy BOOKER wins possession back and carries the ball to the edge of the box before shooting, the shot goes narrowly over. Sixty-three minutes into the game and Kent’s Rachel STEVENS has her shot saved by Courtney SHANLY after she collected a hopeful ball over the top. Eighteen minutes later and Sammy BOOKER takes a free kick which is saved, the rebound is put over the bar by Kylie MANKTELOW. 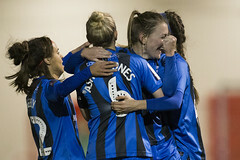 Two minutes later and Gillingham have another chance to make it 3-1 but Kylie MANKTELOW sees her shot go just past the post. 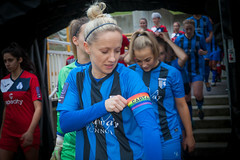 In the end Gillingham Ladies deserved the win after dominating possession and territory, particularly in the first half. The game was fiercely contested in the midfield with some very strong tackles throughout, the wins sees Gillingham safely through to the next round of the cup.